"A Dynamical Theory of the Electromagnetic Field." Philosophical Transactions of the Royal Society of London. 1865. 155: 459–512. James Clerk Maxwell was a mathematical physicist and the first to accept the premises of Faraday's Field Theory. Maxwell not only developed a mathematical model for electromagnetic phenomena but also observed that disturbances in electromagnetic fields traveled at essentially the velocity of light. This publication is one of the most important scientific papers ever published. 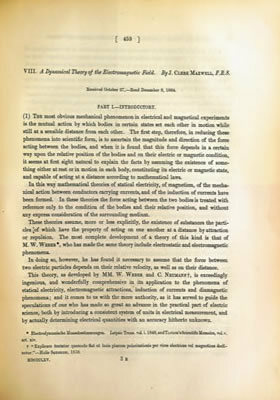 It details Maxwell's work which unified the areas of electricity and magnetism into one single theory. It should also be noted that Maxwell also made a number of other significant contributions to theoretical physics including principles behind the kinetics of gases (e.g. diffusion and viscosity).